We are just beginning to see where green is slowly morphing into responsible consumption. Saving the planet used to be a job for the beards and sandals brigade, but a new generation of right of centre consumers are rewriting the rules of how to be green. Being green is no longer an automatic sign of left leaning politics. The green consumer may still be niche now, but the advent of the neo-greens is a wake-up call to big business. Still too many of today's products are aimed at the eco-elite. Surveys have repeatedly shown that many low-income consumers want to do the right thing but just cannot afford to. 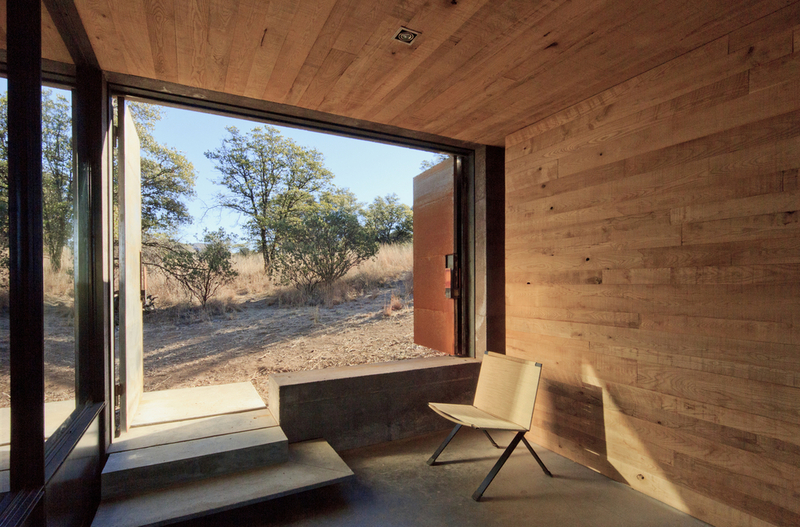 Casa Caldera by DUST Architects is a completely custom-built Tucson, Arizona retreat. "Only thirty yards of waste, one roll-off, was created in the making of Casa Caldera." While a beautiful project, this type of eco-footprint needs to be made available to more than just an eco-elite. Consumers will expect green credentials everywhere in the near future. As eco-products become commonplace, increased competition will ensure prices level out. Any big brands that can’t see this will be in trouble. All things being equal, why not buy the green product? Brands shouldn't see green as an easy ticket to greater market share, if they say they are green, they need to make sure they really are. Don't expect an overnight revolution. Going green is still a luxury, and it will be a decade or so before everyone has bought in. The great thing is that green thinking now is as much about personal quality of life as the quality of the environment. When these things meet across a society then you will see a fundamental change. Until recently, a big compromise was required but that is changing in that everything from fashion to architecture to holidays has a growing green component in terms of preference. I don't think it matters if people come to a green lifestyle through self-interest. If it simply tastes better that’s great. If the car has better acceleration being electric, less noise, clearly an agreeable outcome. If the design is better and more user friendly then all these plus green mean you’re onto a winner. where these new cultural and lifestyle values are requiring businesses to change and are causing major shifts in the political landscape. What is also emerging is a readiness to pay a premium, one which will drop away as competition kicks in. Eco-businesses are all of a sudden adopting attractive aesthetics and moving away from home spun. Businesses that can work and differentiate on the green ticket will win market share. Buying green is a form of political action and consumers can see that their money can make a difference when it's carefully applied. softer tones with the right products, cool design, true tastes and flavours devoid of chemicals, new unadulterated virtues. With these new customer wants, comes the supreme demand on designers to deliver brands imbued with real true qualities of ethics, aesthetics and functionality. Virtue I'm pleased to say is replacing excess. The Wishbone Bike is a product developed in Wellington by Richard and Jen Latham. The bike is sustainably designed to grow with your children, replacing the need to buy, break and throw away multiple products between ages 1 to 5. Donatella Versace once said ‘more is more’ but the neo-green New Austerians would see that ‘less is definitely more’. They are moralising about diet, health and lifestyle and comfortable to pay more for an ethical product. The idea isn't new but it's beginning to go mainstream. Transparency is essential, if a brand has a dirty secret then New Austerians will blog it out of the water. I try to think back to where this tipping point came into view, what’s made us sit up and take heed. I’d like to think it was the scientists but their argument about global warmth and earth science is still too high brow in my understanding. Was it looking at a world on Fox channel with its excessive rhetoric and bigotry, or the raw inhumanity of a grabbing city with its greedy and homeless opposites? I think it’s the harsh extremes which are driving us closer to this tipping point. A pleasing set of insights is dawning upon us. Three things coming together finally as our personal prism. Ethics, aesthetics and functionality. Tesla is redefining what economical means on the road. "With unparalleled performance delivered through Tesla’s unique, all-electric powertrain, Model S accelerates from 0 to 60 mph in as little as 2.8 seconds." It is no surprise then, that simple, honest materials and quiet easy shapes have made a comeback in an era where we have so much discontent. In everything from architecture to fashion modernism is on the rise again. This time consumers want simplicity, transparency, products and services they can trust and brands that communicate these values. We want our homes to be havens from a troubled world. Marketers now need to tread a path in their offering between vanity and restraint. Just take a moment to look at how the clever ones are simplifying the packaging in your supermarket. New austerity is not about doing without, it simply promises individuality for the masses and freedom from the apparent shackles of image and consumption. People are becoming so tired of conformity, the cookie cutter experiences inside retail chains. Provenance and craftsmanship matter more than ever these days. So it's less about flaunting the brand and more about knowing that you're buying a product of premium quality. Luxury is becoming more discreet and legitimacy is of prime importance. The Zurich based company Freitag are combatting waste in the clothing industry. They have recently developed their own material, F-ABRIC, that biodegrades entirely when thrown out. View the video. This total realignment of products and services, this tipping point will eventually redefine us. We will also rediscover long forgotten virtues where we take time to appreciate and understand the things around us. Having an object is not the same as understanding it.